“The evidence is indisputable. Enterprise network managers have begun to embrace and enable digital transformation." 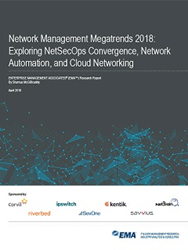 Enterprise Management Associates (EMA™), a leading IT and data management research and consulting firm, has released a new research report titled “Network Management Megatrends 2018: Exploring NetSecOps Convergence, Network Automation, and Cloud Networking,” based on criteria defined by Shamus McGillicuddy, senior analyst covering network management at EMA. Based on a survey of 250 North American and European IT decision-makers, the EMA Network Management Megatrends 2018 research examines evolving network management tool requirements, new network operations organizational strategies, emerging drivers of network decision-making, leading challenges to network operations, and more. It also looks at the impact of emerging macro trends, like cloud networking, the convergence of network operations and IT security, network automation, and the expansion of network management outsourcing. Ultimately, the goal of this biennial research is to understand how network management is evolving. This year’s research revealed a reversal of priorities. While server virtualization and MPLS-centric technologies like WAN optimization remain major drivers, they were eclipsed by next-generation technologies. This year, for the first time, public cloud, private cloud, SDN, and SD-WAN are major drivers and enablers of change in the network. Enterprise networks are evolving to support public, private, and hybrid cloud architectures. They are embracing network automation and software-defined technologies to accomplish this goal. The public cloud is saturating enterprise networks. The average enterprise can trace 45% of all network traffic to the public cloud. Network operations and IT security are converging. 42% of network managers say they are collaborating with IT security more than they have in the past. 92% of enterprises have an initiative to expand opportunities for using network automation. Fragmented network management toolsets are an ongoing operational challenge. 49% of enterprises use 4 to 10 tools to monitor and troubleshoot their networks, and 27% use 11 or more. Key highlights from the research are available in the on-demand webinar. Founded in 1996, EMA is a leading industry analyst firm that provides deep insight across the full spectrum of IT and data management technologies. EMA analysts leverage a unique combination of practical experience, insight into industry best practices, and in-depth knowledge of current and planned vendor solutions to help its clients achieve their goals. Learn more about EMA research, analysis, and consulting services for enterprise line of business users, IT professionals, and IT vendors at http://www.enterprisemanagement.com.